Australia faces multiple challenges in providing high quality care in residential aged care facilities. The resident population is rapidly moving to higher levels of dependency with an associated increase in care needs. This is evident in data which highlights that, between 1999 and 2006, the number of elderly people admitted to facilities requiring the highest level of care increased from around 12 per cent to over 20 per cent. Of this group 50 per cent will die within 12 months. This trend is set to escalate as the population ages and a reliance on community care for all but the most dependant people becomes the norm. 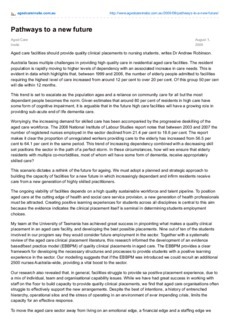 Given estimates that around 80 per cent of residents in high care have some form of cognitive impairment, it is arguable that in the future high care facilities will have a growing role in providing sub-acute end of life dementia care.